I don’t know about you, but I have been seeing a lot of pink lately. Not only am I a fan of the color, but a huge fan of this color’s meaning this month. As many of you know, it is, indeed, Breast Cancer Awareness month, a time for men and women to promote research and to honor the stories of those that have come into contact with this dreaded disease. 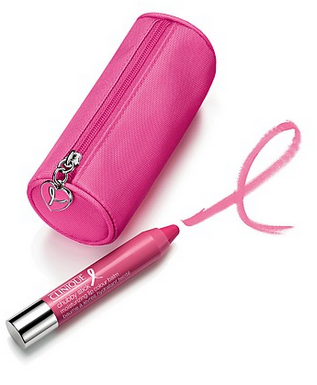 I've uncovered the best fashion and beauty products you can buy to support causes that benefit breast cancer research. Granted, there are no “wishes” in this particular column because I cannot think of better shopping than shopping for a cause. These are all “musts,” ladies! Cause: Saks Key To The Cure, which has provided millions of dollars over 12 years to women’s cancer research. Carolina Herrera designed the tree logo on the $35 long-sleeved T-shirt. I wear mine with black or gray skinny jeans, boots and my gold watch to keep the look elegant and tasteful. Cause: The Breast Cancer Research Foundation, an organization where 91 cents of every donation dollar goes toward research and prevention. With its smart peplum and bright color, I cannot resist this fun dress. It is a bit candy sweet, so I recommend toughening it up with a gray moto jacket and tights. Or you could embrace the Audrey Hepburn inspiration and don the pearls — SEC ladies. Cause: In its sixth annual charity pairing for the disease, the nail color brand will donate to Susan G. Komen for the Cure and Rethink Breast Cancer in Canada. With a package containing a pale pink polish and a sparkly pink polish, can a girl really go wrong? I would recommend trying one statement nail with the sparkly polish and keeping the rest of your fingers in the pale pink. Cause: Avon Breast Cancer Crusade, an organization that has raised $740 million dollars over the past 20 years to raise awareness, prevention and treatment. 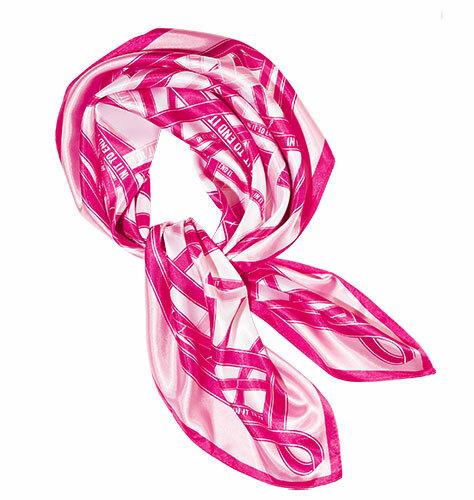 This adorable $10 scarf would look perfect tied on your purse or backpack, don’t you think? Or truly go for the retro look and tie it around your neck like a la Jackie O. Every girl needs a little Clinique in her life! Grab this super cute lipstick and pouch and feel good knowing that what you were going to buy anyways made a difference.